So about two weeks ago I had the pleasure of attending (and lightly volunteering for) the 2015 Different Games conference. I’ve been meaning to write something up about it. It’s really a fantastic experience, and especially so given how short it is. With just an opening keynote evening and then a single day of talks it manages to pack in a lot of great material. I always come away from gaming events and conferences feeling really inspired by the new ideas I’ve been exposed to, and Different Games did that more than most. More impressive than just the content though, the conference fosters a culture of inclusivity and a real feeling of community amongst its participants. It’s that point I want to talk a little more about. The crowd at Different Games is ‘different’ than the typical crowd you see at most of the local games events here in New York (regrettably). There were more women, more people of color, more LGBT people (and particularly trans gamers and developers), more everything, more humanity. It’s awesome! It implicitly ennobles the art form (or whatever you want to call games) to see such a beautifully diverse group of people gathered to discuss it. Note that there’s nothing earth-shattering in that statement, no magic combination of words that somehow erases prejudice. Rather, I think just making a headline statement of “There’s diversity going on here!” might sort of be sufficient. 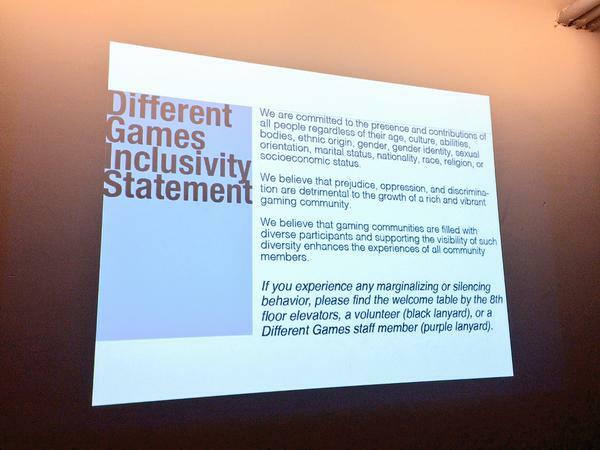 Notably, Different Games is not a place where members of a group who are normally a minority are the majority of participants or something like that- that, too, would produce a feeling of safety and acceptance, but for a different reason. Instead, Different Games gets a lot of different people together and says “Hey everyone, be cool.” And, audaciously, everyone is cool. So it’s place where (at least ideally) no one is made to feel out of place or different because of some immutable facet of their person, and participation is welcome to all. It does make a little sad though, because when people talk about Different Games being a safe or accepting place, it must stand in contrast to the rest of the year’s worth of events and experiences. The annual diversity conference shouldn’t be the sole time that happens, it should be the norm. Especially if the “cost” of doing so can be as small as merely stressing abidance. So, I think its achievable hopefully to see wider emulation of the steps that Different Games takes to encourage diverse participation.